Original 14x22 window card poster. From the film "Mary Poppins" released in 1964. This poster was sent to theatres to be displayed in the lobby to promote the film's engagement. The poster has a tiny bit of wear but otherwise is in. 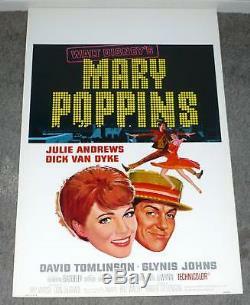 The item "MARY POPPINS poster JULIE ANDREWS original ROLLED 1964 DISNEY movie poster" is in sale since Friday, September 3, 2010. This item is in the category "Collectibles\Disneyana\Vintage (Pre-1968)\Posters, Prints, Lithos". The seller is "granadaposters" and is located in Dallas, Texas.